THE TEA FROM THE SHELL OF THE COFFEE BEAN. Our Cascara is made from the fruits of Pacha Mama and it is a very special tea. It contains 6 to 8 times as much caffeine as coffee, but it is particularly mild in taste. As a product of the Pacha Mama value chain, it stands for sustainable cultivation, hand harvesting and fair compensation, just like the coffee bean. The cultivation in the mixed forest guarantees an optimal ripening cycle, which generates the fruity aroma of the coffee cherry. This is further supported by gentle drying in the sun – the result is a revitalising tea that does not taste like coffee. 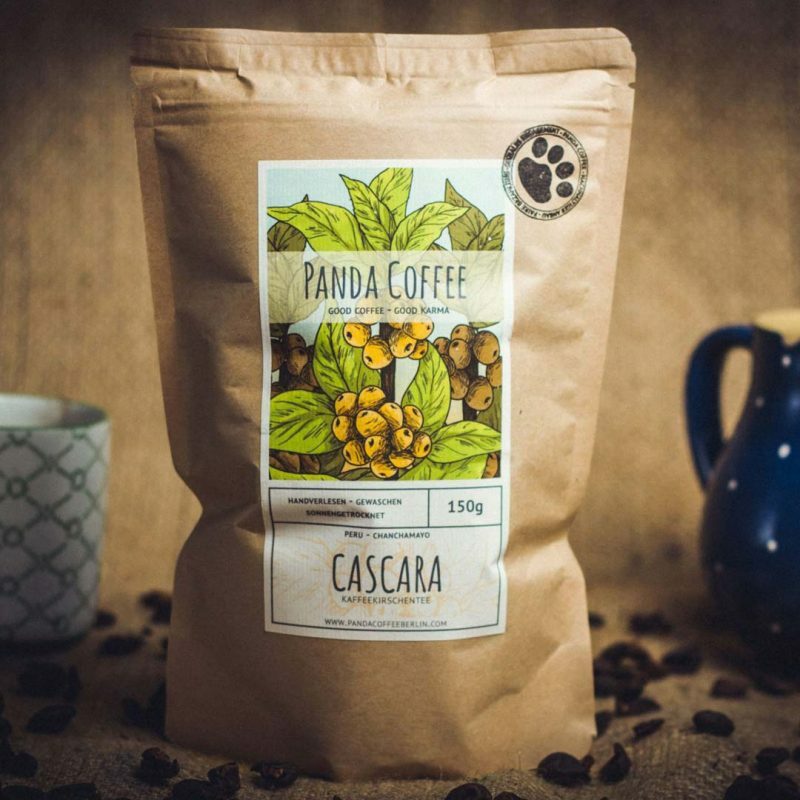 Although people in the coffee growing countries have always enjoyed Cascara, the cherries have still been considered a waste product in terms of exporting them. We at Panda Coffee love its taste and make the Pacha Mama even more sustainable by processing the cherries. Our coffee cherry tea comes from the Peruvian highlands around the town of Miguel Grau in the Chanchamayo region. It consists of the pulps and shells of the finest Arabica beans of the varieties Caturra and Catuai. The coffee cherries ripen for ten months at an altitude of 1,320 to 1,720 meters in shade under trees. These conditions ensure a balanced ripening cycle and give the cherries their fruity taste. In addition, cultivation in mixed culture, unlike in monocultures, does not leach out the soil. From June to July, the coffee cherries are picked by hand and then directly wet-cleaned in water-filled tubs. The bad fruits float up and are skimmed off, the good ones get into the pulper, which separates the fruity husk from the kernel, the bean. The pulp is collected in baskets, the coffee beans land in another pool. After that, the cherries are laid out to dry and turned regularly by the coffee farmers. Only when the bowls are completely dried, they can be packed. The coffee cherries from the Andean region are characterized by an aroma reminiscent of mild fruit tea. The mild sweetness and the gentle aftertaste have a stimulating effect on the body and mind. Due to the gentle drying in the sun a uniform flavor development is guaranteed. The transparent golden brown tea tastes hot as well as cold. In the summer, the cinnamon and mint leaves are delicious, and in the winter, cinnamon, orange and honey. The natural tea is a freshness kick in the morning and a pleasure for the taste buds.